Could this be our first glimpse of the plastic iPhone 6C? Last week we heard a rumour that the iPhone 6 refresh will be comprised of three handsets: the iPhone 6S, iPhone 6S Plus and the return of a "budget" range with the iPhone 6C. Now a new photo leak has shown the handset in the wild with the iconic plastic back in a bright colour pink and a size that looks likely to house a 4-inch display. The rumour mill suggests the iPhone 6C will come at a lower price than the iPhone 6S range but will pack NFC connectivity, TouchID and the Gorilla Glass 3 protection. 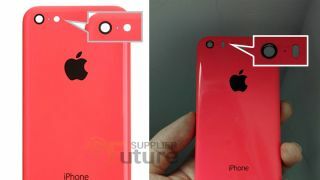 The images come from Future Supplier and show a pink rear housing that looks remarkably similar to the iPhone 5C. There are some subtle differences though with the camera flash on the back cover coming in an oval shape whilst on the iPhone 5C it's round. There are also two sets of speaker holes on the bottom whilst the iPhone 5C only has one set. Prepare a big helping of salt with this rumour though, it's still very early days and we aren't sure how well trusted Future Supplier can be with this sort of information. That said though, it does seem to have a lot of weight behind it with mounting rumours return to the cheaper C range of iPhones. There is certainly an untapped market for those who want a slightly smaller iPhone as not everybody was impressed when Apple upped its screen sizes last September. It's also likely some customers are looking for the latest features but don't need the premium feel body both the iPhone 6S and iPhone 6S Plus will provide.